A new group of developers is trying to tackle the educational app market, which has huge potential for profits, but has been hard to crack because of parent and teacher skepticism about what's actually considered educational. Zynga, an established commercial game company responsible for hits like Farmville and Words with Friends, is hosting the non-profit accelerator in its building. Now in its second cohort, Zynga's co.lab offers nascent game developers access to advice from experienced game, marketing and product experts. The co.lab's first group of developers, which included the hit game Motion Math, worked mostly on games with a clear focus on math or reading, but this group is interpreting the definition of education a bit more broadly and attempting more open-ended learning outcomes. What's more, many of the games in this second cohort are targeting the commercial market first, through parents, while other companies, like Filament Games are trying to broaden the use of games in schools. “Kids are spending a lot of time playing games and parents have no idea if it’s junk food or organic food,” said Esteban Sosnik, executive director of co.lab. As educational games take off, he says parents will be looking for a trusted brand and the right metrics to gauge whether their children are really learning. The co.lab is trying to instill that kind of accountability into the game design process. Zynga's affiliation with the co.lab is meant to help them develop a profitable business model that will scale, which means starting in the commercial market. But Sosnik says the current cohort of developers wouldn't have been chosen if they hadn't demonstrated their interest in entering the school market as well -- and that’s hard to do. “It’s hard enough to make a successful game,” Sosnik said. “For our entrepreneurs, you need to do that and deliver on an educational promise and get teachers to use it in the classroom.” He laughed. “When you look at it that way, you understand why so many people stay away. But that’s why we hope to create some successful models that will inspire people,” he said. 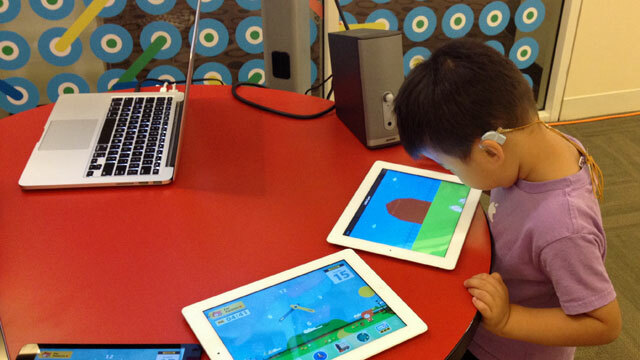 It's been difficult to prove learning efficacy from educational apps. A Joan Ganz Cooney Center has been calling for either voluntary or regulatory reporting on app and game efficacy. But it's still very early days, and new studies are rolling in all the time, with some reports suggesting that some math and science games do boost students' test scores. One of the companies Sosnik is most excited about is TinyTap, an app that allows kids and teachers to create their own content. “It’s the potential of putting kids in the driver seat,” Sosnik said. “And turning educators into content creators, the rock stars.” The app allows a user to create a series of pages -- what amounts to an app in and of itself -- that explains a concept. It offers a lot of room for creative play by allowing the creator to find and use images online, record narration, and create a narrative sequence themselves. Users can follow one another’s profiles and TinyTap will even highlight really strong educator content so other teachers can find it. Another co.lab company, Pixowl, leverages the popularity of the building game Minecraft, which is very popular with educators because of its open building premise. It offers a similar kind of limitless exploration, but in a two-dimensional world. Players can immediately start building things, rather than Minecraft's model of wandering around the space collecting resources that eventually allow them to build. Brainquake is an exploratory math game that allows for experimentation, meant to help kids develop an understanding of what numbers mean beyond the symbol. If a child gets something wrong while playing the game, there’s no red X or other sign of failure. They just keep trying until they get it right. Kiko Labs is a brain training game for kids aged three to six. The idea is to help them develop memory, control and attention through different exercises. Kiko Lab’s CEO Grace Wardhana has young children of her own and is sensitive to the concerns that little kids shouldn’t be on screens for long periods of time. To address this, she’s designed each session to be just a few minutes long. The company is working with educators at University of California, Berkeley and Harvard to externally validate the game’s efficacy. Timbuktu is a game meant to teach kids about healthy eating and the importance of physical activity. The game designers are trying to incorporate prompts for kids to go outdoors and engage in physical play as part of the virtual game. That part is still in development. Kid Bunch is more of a narrative than a game right now, but they hope the accelerator will help them parlay the animation and storytelling they’ve already been working on into a gaming environment. They’re in the accelerator to learn how to make a game. CourseMaster is the outlier, with a platform to allow offline and online communication between teachers, students and parents. NewSchools Venture Fund, whose former CEO Ted Mitchell was just named Under Secretary at the Department of Education, supports the co.lab initiative. The venture fund is known for seeding ed-tech start-ups, but hasn’t traditionally focused on games.